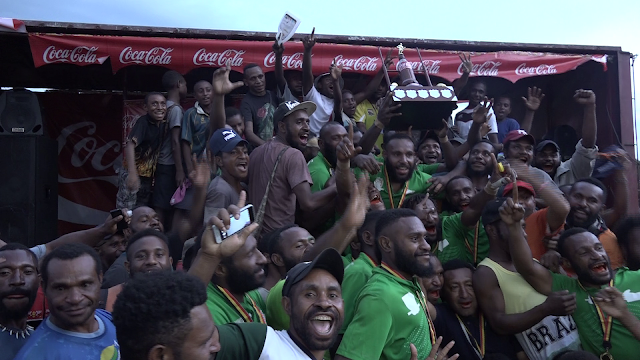 The Mendi Butterflies Rugby League team has claimed the prestigious 2017-2018 Coca Cola Ipatas Cup in Lae, dedicating their victory to their beloved people who have been affected by the recent earthquake in the province. “Election related violence and the recent earthquake disaster in the Southern Highlands province have hampered our preparation and training, but we have worked hard to come this far,” an excited skipper Pore John told NBC News. Mendi OLCO Butterflies won the Ipatas cup and K50,000 prize money for the third time in 18years after edging out a spirited Wapenamanda Brothers 20-17 in extra time. “We weren’t expecting to come this far, but the committment showed by the players has been the force behind the win,” says John. The Ipatas Cup is the biggest offseason rugby league compettion in Papua New Guinea which has attracted 138 teams in it’s 2017-2018 season. Another Southern Highlands team Mendi Bulldogs also finished fourth in the compettion collecting the prize money of K10,000. On Saturday the Mendi Rugby League and Mendi Muruks franchise were hosted to a trial match with the Enga Mioks of which gate takings were to be split between the two provinces to assist disaster relief efforts. The 7.5 magnitude earthquake that struck the Highlands region on February 26th 2018 has laimed more than a hundred lives and left thousands of people homelessa nd their food gardens destroyed. The Mendi rugby League field at Tente was also damaged by the earthquake. The Mendi teams worked so hard over the last two weeks to prepare for the finals and the achievment was sweet with some of their players being snatched by Digicel Cup teams. The Ipatas Cup throphy will be brought over to the disaster devasted township of Mendi tomorrow (Monday) where it will spend a week before returning to Lae.